So the question I ask myself before I give any calculus lesson is: “Why on Earth would anyone actually go through the trouble of doing it this way?” There really is a rich set of useful problems that can only be solved using differential calculus, so why not present them (or, God forbid, let the kids think of them) to students and work your way out? My rhetoric here is getting a bit lofty, and I hope my actual lessons don’t end up being a let down, but they sometimes are for me, too. It turns out that it’s hard to come up with real things for math to do when you’ve only been modeled the most sterile way of learning math. I find this kind of exuberant, confident, loose-limbed classroom introspection pretty much irresistible. It’s rare you find an edublogger this prolific who also works full-time in a classroom. Put your money in Shawn Cornally, Inc., while his stock price is low. Dan, I’m totally with you on this line of thinking but only up until a point. I’d add a further layer to your line of questioning: who cares? Who cares how fast you can fill it up? Ultimately, the motivation to learn needs to be intrinsic from the student. Just making something more flashy (as much as I think technology can help here) isn’t enough. We need to also make it relevant. Maybe someone can help me find some sense in Joe’s objection. As a starting point for a rebuttal, WCYDWT has less to do with “flashy technology” than it does with a template for talking about math. Some technologies enable that conversation better than others. That’s all. If we’re planning on paring math curriculum down to the material about which students instinctively care, Joe needs to prepare himself to trim Algebra 1 down to somewhere near the size of a Scientology tract, the stuff that explicitly involves video games and cell phones. On the upside, we’d finish the school year somewhere in October. On the downside, you’d lose the entirety of pure math. A closing anecdote and then a wager. I posted a video series not long ago where I walked down two flights of stairs. Nothing more than that. It’s hard to say why anyone should care about a guy walking down stairs. It’s a totally mundane scene. 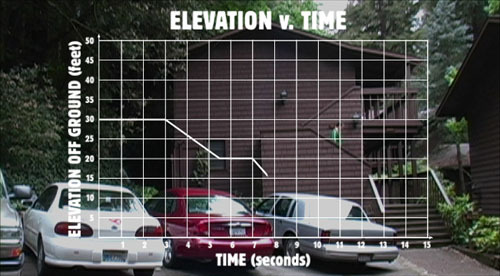 It’s harder still to say why anyone would care about a graph of that scene. Mundane + Math = More Mundane. Right? Play the water tank video clip in front of a class of students of any age between 12- and 30-years-old. The video is best served cold. No music. No text. No introduction. One day I introduced a lesson based on a challenge presented by Dan Meyer (The Wager from “Who Cares?”). I played about 20 seconds of a video clip created by Dan Meyer of a transparent tank filling up with water at the beginning of class. I asked each group of students to predict how long it would take to fill the tank. Their guesses ranged from ten minutes to a few hours. 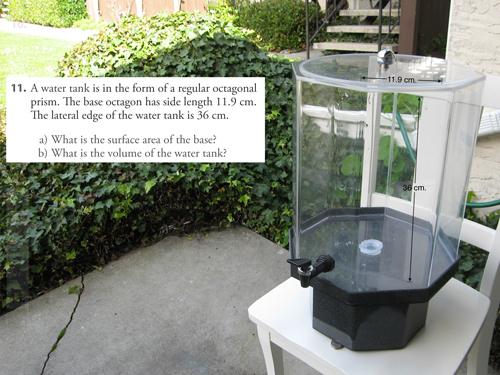 The fill/drain a water tank problem is a pretty easy, if unexciting, application of linear equations to a real-world situation. 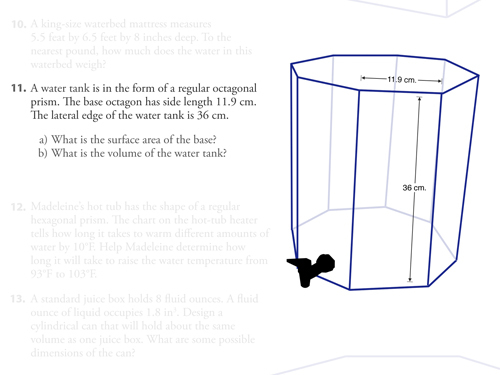 Yet, by allowing the students to actually see the tank and having them make a prediction, the plan was to engage the students in the process of discovering the answer. After the students made their predictions, I abandoned the water tank problem and moved on to something completely different. In each one of my classes, eventually a few of the students made a comment along the lines of “you never told us how long it took to fill the tank.” Sometimes the comment came only a few minutes after we had moved on. Other times, it came much later. More convincing evidence of the students’ level of engagement in the exercise came at the end of the lesson when I played the rest of the video. With their focus on the screen, you would have thought they were watching a summer blockbuster at the movie theater, not a tank filling with water in a classroom. I used the engagement of the students to invest them in solving a problem that involved some critical thinking. When we revisited the problem, I avoided the temptation to hold the students’ hands through writing a linear equation to represent the situation. Instead, I simply asked them to come up with a justified answer to the question of how long it would take to fill up the tank. Some students’ answers included a rate of change and/or linear equation. Most of the answers didn’t. All of them experienced the struggle, including failure, that it takes to solve a real problem, and the first group was able to make a connection between the content covered earlier in the year and a problem they had not seen before. The problem claims to represent the real-world but its illustration is only clip-art or a line drawing. The problem only gives information that the student will use in the solution. The real-world problem presents itself as it exists in the real world. The problem reveals no information about itself — no measurements, especially — forcing the student to decide for herself what information is relevant to the solution. The problem doesn’t hint at its own solution method with substeps. The student can develop that solution socially, in conversation with her teacher or her classmates. The problem hangs itself on a single, concise, intuitive question, one that any student can answer, regardless of mathematical ability. The teacher solicits guesses and records them publicly, investing the students in the outcome of the exercise, and refers back to them later, perhaps introducing the concept of percent error. The solution to the problem isn’t read from an answer key. Instead, it’s observed by the class together in a second multimedia artifact. The class compares the answer derived from their theoretical model to this practical answer. This is scary. The class will almost certainly be wrong but the conversation about sources of error should be embraced, not feared. The question: how long will it take to fill up the tank? 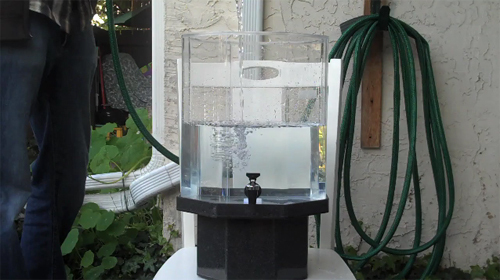 WCYDWT: Water Tank + Timer from Dan Meyer on Vimeo. There’s some dynamite material in the comments of the previous post, particularly from Alex, Andrew, Frank Noschese, and Steve Peters. For anyone interested in curriculum design, please consider: which of these is the better question to ask a class? How much time will it take to fill up the tank? 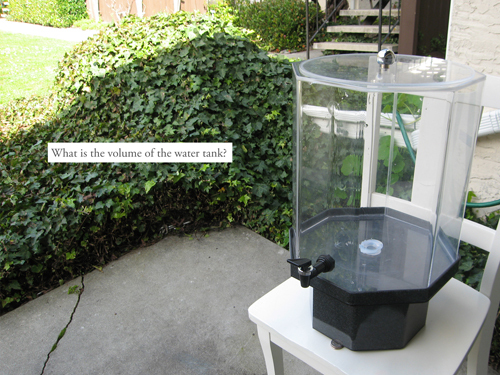 How much water will the tank hold? Your answers and their justifications are due in the comments. Use a #2 pencil.